I know a lot of you are using the free websites available through AMTA and ABMP, or maybe you’re using Weebly, Wix, or WordPress. I’m really glad that you are taking advantage of internet marketing. After all, almost 80% of your potential client base is using the internet to find products and services. There’s nothing wrong with being thrifty, either, although I’m still not a huge fan of the free AMTA and ABMP sites, but money doesn’t grow on trees and WordPress.com, Weebly or Wix with a custom domain is not a bad solution. Especially for those of you who get sweaty palms thinking about the technical, geeky stuff that comes with creating a website. like installation, setup, settings, and updates. That can help bypass a big source of stress for a lot of small business owners. We have enough stress in our lives, just trying to do bookkeeping, laundry, marketing, networking, newsletters, and all the other millions of tasks that come with running a massage practice. Having something that takes one source of stress out of your day should be celebrated. If you don’t have a web designer that can help, then the DIY website providers are your best choice. So you sign up for an account, pay the small extra fee for a custom domain (it’s worth the money, trust me), login in, pick a theme, click on “Add new page” to start work on creating your Home page. What exactly should you put on the Home page? So you get up, make a cup of tea, grab a snack, and settle down in front of the computer. You still have no clue what to put on that home page, so you check out some of the massage therapists’ sites in town, and kind of copy what they do. Now you just need to do the same for a few more pages and you’ll be done with that website. You’re going to need a lot more tea. I design a lot of website for massage therapists. I’ve even salvaged some sites after they got scammed by someone in the industry. I know what you’re up against. No one teaches this online marketing stuff in massage school. Ok, I do, and I know Allissa Haines over at Writing a Blue Streak does, but we’re definitely in the minority. What is the problem with DIY websites? When I talk to business owners who are trying to create their website content, I get the sense that they are just as lost as you are trying to figure out what to write on their website. They have a blank sheet of paper, a lot of confusing articles and blog posts on what to put on their website, and an empty WordPress or Weebly site they have to fill up. So, they delay a bit, walk around the office, make some tea, eat some snacks and finally resort to copy and pasting from other websites. And they hope that it works. You just can’t get away with that anymore. Website visitors have seen a lot of websites by now. They can recognize a good website from a bad one and they really have little patience or interest in sticking around if it’s bad. And don’t even think about using autoplay on videos! So the result is that the DIY websites don’t tell you what to put on that website or how to make that content great. So you end up with a website that might look pretty, but it never really brings in any customers. So the real problem with those free and DIY websites is: They don’t work! All that time and effort wasted on a website that doesn’t work. That makes me very sad because I hate to see someone spend time and money on this terrific marketing tool and not have it bring them any business. That’s why I created a course that will walk you through creating website content, step by step. Content that your website visitors will connect with and love. Content that will get them to do business with you. I taught this course once before and the students who worked through all the material have seen it work. I use these same concepts when I’m creating a website. (Psst, some of this stuff works for flyers and newsletters, too). This is my secret sauce. I’ve spent years studying web design and content marketing. I’ve bought books, taken classes, and attended seminars. I’m putting everything I’ve learned and used into this course. I’m not holding anything back. If you are ready to get your website working and bringing in business, then you don’t want to miss this class. Registration is now open and we begin on December 1st. 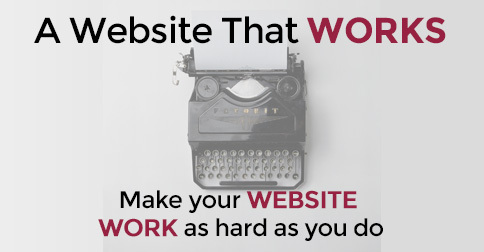 Why not start 2015 with a better, more effective website? Your massage practice deserves a great website! If you are ready to make it great, click on the link and sign up or read more details. Keep people up to date on the latest research. You have access to this via industry websites and blogs, pass that along. Talk about your specials and holiday offers. Talk about other things going on in your business, like road construction or new wallpaper. Oddly enough, people are interested in this stuff. It’s already been written. Why would anyone read my post if there’s nothing new in it? It’s true, someone has already written a blog post explaining what “undress to your level of comfort” means. You’re not going to blaze any trails in that subject matter. In fact, it’s unlikely that you are ever going to come up with something completely original, even if you think it is. Someone else has probably already beat you to the punch. And it doesn’t matter one tiny little bit. Before I explain why, I’m going to give you the most basic of basic explanations of how Google/Bing/Yahoo (we’ll just call this Google to save time) work. Trust me, it won’t be too technical and it will make all of this make sense. When you type a search into Google , Google knows where you are physically located. No, they don’t have some secret tracking hardware on your computer or phone, but they do know what computer network your are using. It’s like knowing your area code on your phone. 312 is Chicago. So Google knows that you are not only in Chicago, but you are downtown at a Starbucks next to the Art Institute. Google wants to give you useful information so that you will continue to use Google and not another search engine. So knowing where you are at is a handy piece of information. If you type in “kosher bagel shop”, Google could show you any number of bagel shops in New York City, but that wouldn’t be useful to you. You’re hungry now and have a great parking space, so you want something within walking distance of the Art Institute. So, instead of showing you the listing for the top ranked bagel shop in Manhattan, Google will show you the top ranked bagel shops closest to where you are physically located. 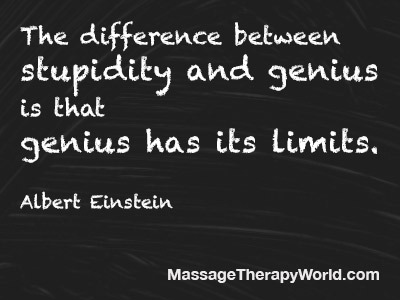 For a brick and mortar business, like your massage therapy practice, this can work to your advantage. If you are working your website and blog posts so that you will rank well for your local market, when someone in your town googles “massage therapist”, you are going to be on the top of his search results, not a massage therapist across the country. You are a smart blogger and can take advantage of this. If you are in Tacoma and another massage therapist in Boston write blog posts on the same subject, someone in Tacoma will see your post because Google knows you are closer to that person than the MT in Boston. Local people are more likely to see your posts. But only if you are writing them. You don’t need to be original, you just need to be useful. Write about stuff that people are interested in so that when they find your blog post they decide to call and schedule an appointment. I don’t want you plagiarizing someone else’s work. But if you read a blog post and get inspired to put your own spin on it, then write about that. Or explain it in a way that is important to your clients. Did this help explain why you don’t need to come up with all original ideas? If not, let me know what questions you still have and I’ll do my best. I started this post last week. August 29th, to be exact. Sparked by the same Facebook post that inspired Allissa Haines to write about not making fun of your clients in a public forum. Then, a couple of days ago, Dale Favier wrote one of the most beautiful explanations of how most massage therapists view their clients’ bodies. These two posts, written by 2 of my favorite bloggers, are a part of what I want to talk about today. And because of these 2 posts, I’ve made a few edits. Do you really understand how self conscious most people are about their bodies? I don’t think you really do. Everyone has their own set of physical flaws and most of us exaggerate the scale of those flaws in our own heads. Even the most beautiful people on the planet get plastic surgery and request airbrushing to cover up the little imperfections. The magazines at the supermarket checkout feature celebrities with cellulite (gasp), or paunches (no way), or, brace yourselves, without makeup. And these are the beautiful people. Most of us, however, aren’t blessed with perfect facial symmetry, flawless skin, six pack abs, or a full head of hair. And we, everyone one of us, is aware of just how imperfect we are. Our comfort level with that lack of perfection is probably all that really varies from person to person. Our clients are just as concerned with their imperfections as we are. The big difference is, they are undressed during the massage. We are fully clothed. How many people do you think won’t get a massage because of body issues? That’s 4 people that publicly stated they wondered what massage therapists would think of their imperfect bodies. I could go on, but you get the drift. Yes, I know, you’re not posting this for your clients to read but, guess what, these posts aren’t as private as you think they are. I’m going to give you an example of social media done wrong. I was at a non-massage related conference (just so you know that this isn’t about any of you). A friend of mine came up to me during a break looking rather shocked and upset. It seems that she had introduced herself to someone she follows on twitter. They chatted for a couple of minutes and then my friend went on her way. As she was reading her twitter stream, she saw that this person posted on twitter about having just met someone and how she was now ‘infected’ by this person’s unpleasantness. (The actual tweet was pretty offensive, so I’m not going to go into it). My friend ‘knew’ that this tweet was about her. She was embarrassed. Disappointed. Humiliated. Angry. She was the unacceptable little troll that had had the audacity to introduce herself to some D-list blogger and ruin this blogger’s coolness. I had to point out that the blogger’s tweet went out about 2 hours after the meeting, so it was highly unlikely to have been about my friend. But that’s not the point. Without knowing it, this blogger had probably hurt several people she met that day with that one little tweet. A lot of people who follow her on twitter and went out of their way to very briefly and politely introduce themselves. A lot of people who were now worried that tweet was about them. A lot of people who may have been potential customers. When we post the jokes and the comments about our clients, you can believe they are paying attention. We all slip up and do stupid stuff online; even me. But I see a lot of therapists throwing stuff out there online without really thinking about how it looks from the client’s point of view. If you had a massage today and then see that your therapist is talking about a client with stinky feet, even if your feet smell like roses, you might still wonder if it was about you. If you were a little shy about getting a massage because you were self conscious about your body and an MT was posting about a client’s body, wouldn’t you be less likely to schedule a massage? Can we use just a little bit of common sense when using social media? To give you an idea of how big an issue this is, Dale’s post had over 20,000 views. I know Dale; he doesn’t have 20,000 regular readers on his practice’s blog. So, he obviously struck a nerve with the general public. Those 20,000 people who viewed the site are potential clients. Many of them probably want some assurance that they don’t have to look like an airbrushed model to get a massage. And honestly, I’ve only ever met a teeny, tiny handful of MTs who cared about a client’s appearance and none of them are in business anymore. Every single one of you finds the human body as fascinating and beautiful as Dale does. In its infinite variety; tall, short, lean, muscled, young, old, and everything in between. So here’s your marketing tip: watch what you say online. There are 20,000 people out there that would really love to get a massage if only they believed that you aren’t going to judge them. Oh, and there’s one marriage proposal, but he’s already married and Oregon doesn’t allow multiple wives. We’ve covered how to add Google Analytics tracking code to your website and briefly described what data is available in Google Analytics. In this post, I’m going to show you what real data looks like, what it looks like after you’ve published 30 blog posts in 1 month, and what kind of strategic changes should be considered based on that data. Just because we’re friends (we are, aren’t we? ), I’m going to share some of the traffic data for this blog. I’ve gotten rid of some of the raw numbers, because they don’t really matter much and I don’t want to distract you with that. What I want you to see is the difference between data taken July 2 – 31 and data taken August 1 – 30. Here’s the big graph of VISITS. The blue line is August, when I blogged every day, and July where I only blogged 6 times in the first half of the month. You also see that the traffic leveled out the last half of the month of August. I was posting later at night and not promoting it as heavily on Social Media. I suspect that the visits dropped due to the time of publication. I’ll experiment with this more in September to see if the time of day continues to have an impact on traffic. Visits and Pageviews were both nearly DOUBLE compared to July. While the Visits were 73% higher, the unique visitors was only increased by 35% and % New Visits were down by 23%. All 3 of these changes were in line with my goals. Why would I want a decrease in % New Visits? Because I wanted to see an increase in return rate. In other words, I wanted to write content that would draw the same people to keep coming back for more. The Pages per visit increased while the Bounce Rate decreased. These are both in the direction I wanted. Not only were people reading more pages when they visited, but the amount of time they spent on the site increased by 57% – a pretty hefty increase. Blogs will usually have a higher bounce rate than a static site. Why? Because regular readers will come and read the new post of the day and then wander off. New readers, hopefully, will read the new post, like it, and read a few more posts. August was a month of blogging every day, but I don’t think I’m going to be able to write a post every day forever going forward. I’m concerned that some of the leveling off in visits may have been reader fatigue, but that’s something worth testing again in the future. I will be blogging more often that in the past. I believe that ya’ll like the shorter posts with the occasional long winded, detailed posts. I’ll be testing some of that, in the future, too. I’m happy with the current ratio of new to returning visitors and I would be willing to let it get to 50%/50%, but I always want new visitors – that’s how you grow a market. I will be watching to see what keywords are bringing in new readers and to see how many visits are the result of my social media promotion efforts and tweak to maximize the results. I’ll also be watching to see which posts get the most views and comments to help determine if I’m writing about things you want to read. Of course, you should always feel free to let me know what you’d like to see me cover. So that’s what happened to my blog after blogging 31 Posts in 31 days (actually, 30 posts, this is #31). I can’t guarantee that you will see the same results – or as they say on the interwebs: YMMV (your mileage may vary). Go check your analytics data today and compare it to some time in the past. What one piece of data would you like to see improve. Do you need suggestions on how to improve it? Ask here and let’s see if we can’t find a way to improve the traffic to your website.